Recently released picture sharing iPhone application, PostShare, has just introduced a unique download giveaway, offering $1,000 to a random user just for downloading the app. Available presently in iTunes for no-cost download, PostShare also rewards users for sharing their content on Facebook and Twitter, and other sources, using the application. We are excited to launch our introductory download giveaway for PostShare. Just by downloading this app from iTunes, one of you may end up taking home $1,000. Download it right away because this offer will be valid till the 3rd of September. B2Betrader LLC’s advanced photo sharing app PostShare is now making it possible for users to win lucrative rewards just by downloading the app and sharing their pictures in different social media platforms. The developers of PostShare have just announced that everyone downloading the app from iTunes will now have a chance to win $1,000. It has also been declared that this limited period offer will remain valid until the 3rd of September, 2014. PostShare also offers lucrative weekly, monthly, and annual rewards for posting pictures on Facebook and Twitter using this state of the art photo sharing app. With the advent of advanced mobile devices, content sharing mobile apps have gained immense popularity. PostShare makes it possible for users to post and share pictures, goods and services through all forms of social media. Though there are many similar apps available in the market, none is known to offer rewards to users for downloading or using the app. B2Betrader LLC’s decision to start their unique download giveaway program is expected to boost up the app’s download rate in these early days. To enter this download giveaway contest, download PostShare for free at https://itunes.apple.com/us/app/postshare/id898787612?mt=8. In addition to the download giveaway, PostShare also offers excellent rewards based on the number of views received by the posts shared using the app. $100 will be offered each week to the user with maximum views for the week. User with the most shared views for all their posts throughout the year will receive two tickets to the Professional Football Big Game in 2015 and a cash reward of $3,000. To find out more about getting rewarded by sharing content with PostShare, please visit http://www.postshare.com/. About PostShare: Developed by B2Betrader LLC, PostShare is the best way to share content with friends and followers. It allows users to post and share anything. 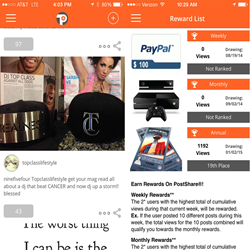 Unlike any other app, PostShare also gives rewards to the users who drive the most views to their posts.